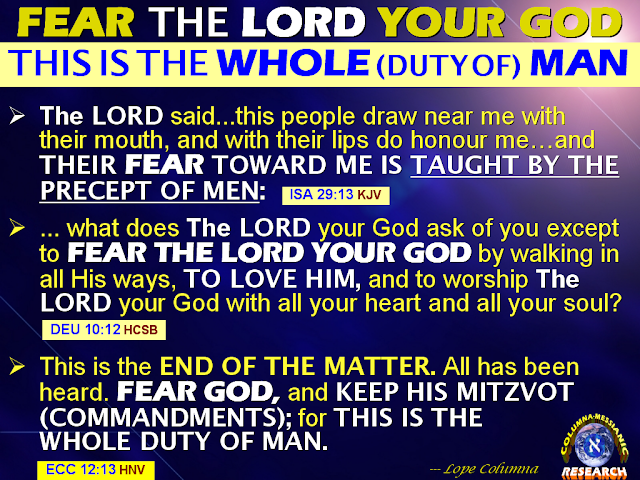 COLUMNA MESSIANIC RESEARCH CENTER: Do you have the Sacred FEAR OF THE LORD GOD, Which is The Foundation & Core Teaching of The Bible And Salvation? Pastors, Priests, Rabbis, Churches, and Religions Are NOT Teaching It. We hear a lot of sermons, and read a lot of articles about the LOVE OF GOD. But, The LOVE OF GOD is NOT the BEGINNING or FOUNDATION of ALL BIBLE TRUE TEACHINGS. According to the Zohar and the Bible, the Sacred FEAR OF GOD is the very First Step or BEGINNING to understand and obey GOD and ALL HIS BIBLE TEACHINGS (Psalm 111:10, Proverbs 1:7, 9:10). But, we rarely hear messages about the Positive FEAR OF GOD. And if we hear sermons about the Fear of God, the teachings are all Negative and are based on the concepts of men, not of God! WITHOUT THE SACRED FEAR OF THE LORD GOD, YOU CAN NEVER UNDERSTAND THE BIBLE. AND YOU CAN NEVER SERVE AND WORSHIP THE LORD ACCORDING TO HIS WILL! Today, Churches and Pastors almost avoid teaching this subject of FEAR. If they do, they teach the wrong concepts, usually their own concepts about the FEAR OF GOD. As a result, this subject of the FEAR OF GOD is now grossly misunderstood by many people and Churches. Thus, corruption, immorality, deception, idolatry, terrorism, crimes, and all kinds of evil abounds! God revealed the True Meaning of the Fear of God only to the Filipino ravenous Man from the Far East (Isaiah 46:11). 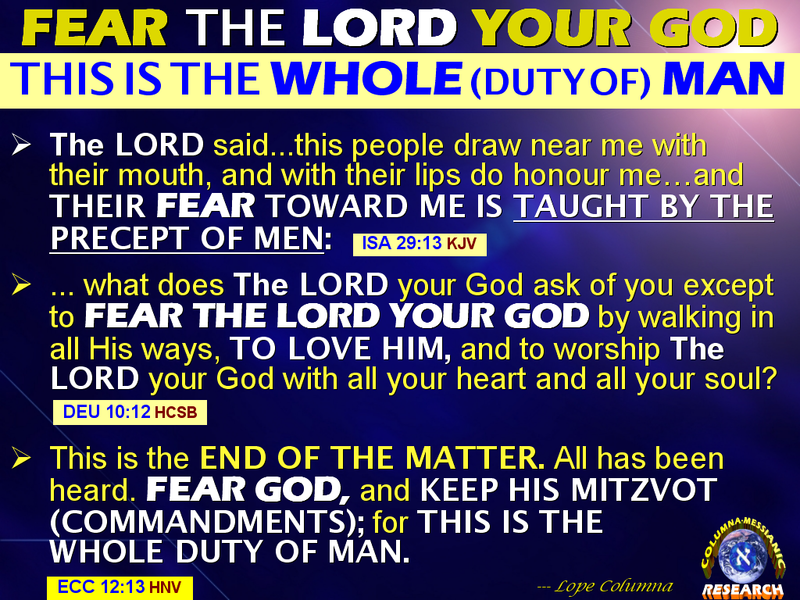 Now, you can really know and understand the true meaning and importance of the sacred FEAR OF GOD! WHAT DOES IT REALLY MEAN, FEAR OF GOD? Today, there are lots of confusing definitions and misunderstanding about the true meaning of the FEAR OF GOD. Many people and religious groups think that the word FEAR is negative and should be avoided. And they would even distance from a Teacher that they think promotes fear, calling it "fear tactics." And the person telling them the Truth; they call a "Prophet of Doom." But, if that person tells you that your house is burning (nasusunog), will you ignore the message, and not listen to that person; because he is using "Fear Tactics" and that he is a Prophet of Doom? Some define "Fear" as the antithesis of "Love." Others say that they don’t need to "fear" God, because God is "love," and God "loves" them, and they "love" God. What a hodgepodge of confusion! HOW IMPORTANT IS THE PROPER UNDERSTANDING OF THE 'FEAR OF THE LORD GOD' TO YOUR MISSION IN LIFE, SALVATION, AND TO THE SOLUTION OF ALL THE CRISES OF MANKIND? The RIGHT ANSWER to these questions is the TRUE PURPOSE and CORE TEACHING of the BIBLE! Having the Right Kind of "FEAR" Toward The LORD is the very first step before you can begin to have a real and lasting relationship with God, which means before you can have Salvation. Failure in this first step will turn all the efforts and time to serve and worship the LORD God into vanity and inutile endeavors! Thus, it is of super-importance for every person to understand the subject of FEAR, especially the Sacred FEAR OF GOD. We must know it's proper place, meaning, and importance in the overall scheme of things, especially in our proper relationship with the Creator God. The TRUTH is that: The Sacred Fear of God is the greatest and the very foundation of all precepts and commandments of the Bible. And the only reliable source of this Truth is God Himself, not Churches or Persons. To misunderstand this particular FEAR OF GOD precept will lead you to transgress all the precepts of the Torah or Bible! This is how important, and how serious this subject of the FEAR OF GOD is (Ecclesiastes 12:13, 3:14)! Yet, many Christians and religious people opted to listen more to the teachings and doctrines of men about the LOVE and FEAR OF GOD. They would not listen to God Himself. Thus, God send them the STRONG DELUSION (2Thessalonians 2:9-11), for them to believe lies about the LOVE and FEAR OF GOD! People just want the LOVE OF GOD, but reject the FEAR OF GOD! But the very purpose why God gave His Bible to Man, is to help Man develop that Godly Fear necessary for Salvation and Eternal Life! IF YOU DON'T UNDERSTAND THE FEAR OF GOD, YOU ARE CONTROLLED BY YOUR EVIL INCLINATION, WHICH LEADS YOU TO DECEPTION, IDOLATRY, CORRUPTION, AND ALL SORTS OF SINS AND EVILS! Some People define Fear as Awe, Respect, Reverence, etc. Awe, respect, and love for God are important, but many people love and fear God in an ignorant manner. The problem with awe, reverence, respect, etc. is that these could be easily applied to other deities, angels, and even human celebrities. Without the correct definition and understanding of the "fear of God," these human definitions become fertile grounds for deception and idolatry. In other words, these definitions can easily corrupt human minds. So, we should not wonder with the many corruptions and evils that we see and experience (in Religion, Government, Education, Businesses, etc.) in our society today. GOD DESIGNED THE PHYSICS OF FEAR TO SAVE YOU! Fear is a natural and normal part of life. It is a very important safety and survival mechanism built by God into every human being. If you really want to know the meaning and importance of FEAR in your life, Study Physics. If you fall off a cliff or high-rise buildings, Physics doesn't care who you are, or what religion you observe => The Law of Gravity will smash you to pieces or break your bones! So, FEAR gives you the Energy and Wisdom to avoid accidents and Death. Thus, we can see here that FEAR is a safety and survival mechanism built by God in our psychology to protect and save us from dangers. This safety mechanism of Fear is useful both in the physical and spiritual dimensions. NO ONE WILL BE PROTECTED AND SAVED WITHOUT THE PROPER FEAR OF GOD! From Genesis 1:1 to the last Book of the Bible, the Fear of God is emphasized by God. And Protection and Salvation are promised By God to all those who FEAR HIM (Psalms 31:19-20, Rev 19:5). A voice came from the throne, saying: Praise our God, all you His servants, YOU WHO FEAR HIM, both small and great (Rev 19:5 HCSB)! If you want to be saved, you better listen to God, and acquire that genuine FEAR OF GOD. Otherwise, you will be rejected by Jesus Christ at His return! The next articles explain the Fear of God according to God Himself! It's time to throw away your man-made and man-taught ideas and doctrines, and listen to God's supernal revelations! Continue on: ALL PREACHERS AND CHURCHES THAT DO NOT TEACH THE GENUINE FEAR OF GOD, ARE GREAT FAILURES! They Became FALSE PROPHETS and FALSE CHURCHES! will eventually come back from now on. I want to encourage you to continue your great writing, have a nice weekend!